We have it on good authority that Clubcard boost starts on Monday 18th May. You will be able to benefit from it until Sunday 28th June. For all of you who don't know exactly what Clubcard Boost is, it is when your Clubcard vouchers are doubled. 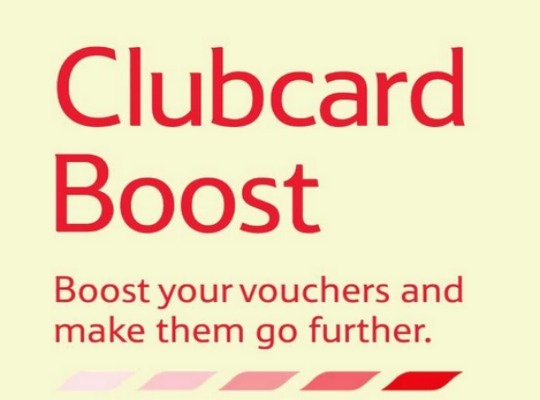 So, £5 of Clubcard Vouchers end up worth £10 of Boost vouchers to spend in-store or online. It is on selected departments only, and there is normally a good selection of what you can double up on. If you wish to boost your Clubcard Vouchers to double their original worth,you can do so instore without picking a department to spend them in. However if you wish to use vouchers online you will have to select the department online to Boost. Points for the previous Points Period (up to May 7th) are currently being calculated and may show in your Tesco Acoount online later this week. You can start planning what to spend you CC Vouchers on here*.